Salad is a very subjective dish. Some love it, some hate it and some only eat it when they are going on a diet. As we’ve been battling with the heat these few months, a salad would help to cool things down better than bowl of tomyam noodles. It gets plus points for being healthier too! Since the usual salads on sale comes with a not-so-healthy dressing and might contain a certain vegetable that you don’t like, why not make your own? You can choose to put whatever ingredients and dressings that you want, that way you know what goes into it. Even the pickiest salad eaters will have no excuse to not enjoy their own masterpiece. Here’s our step-by-step guide to making your dream salad. The combinations that you can create are endless! 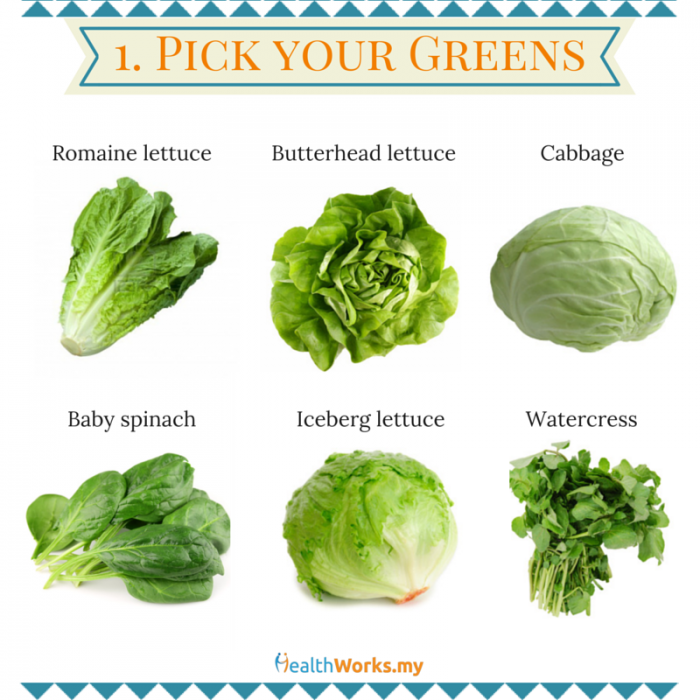 Start with a base of greens such as romaine lettuce, baby spinach and more. Romaine lettuce is rich in vitamin C and is high in water content which helps keep you hydrated . If you have a bigger budget, try arugula leaves as they have a peppery taste which can save you the trouble of adding extra black pepper. 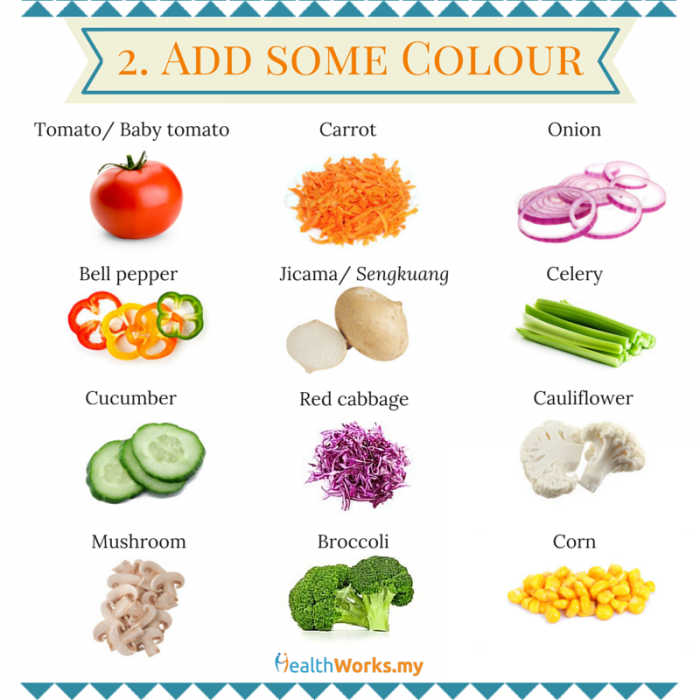 Now drop in some colourful vegetables to make your salad more nutritious and dynamic! Jicama or sengkuang is high in fiber and low in calories so it’s a good addition to your salad ! 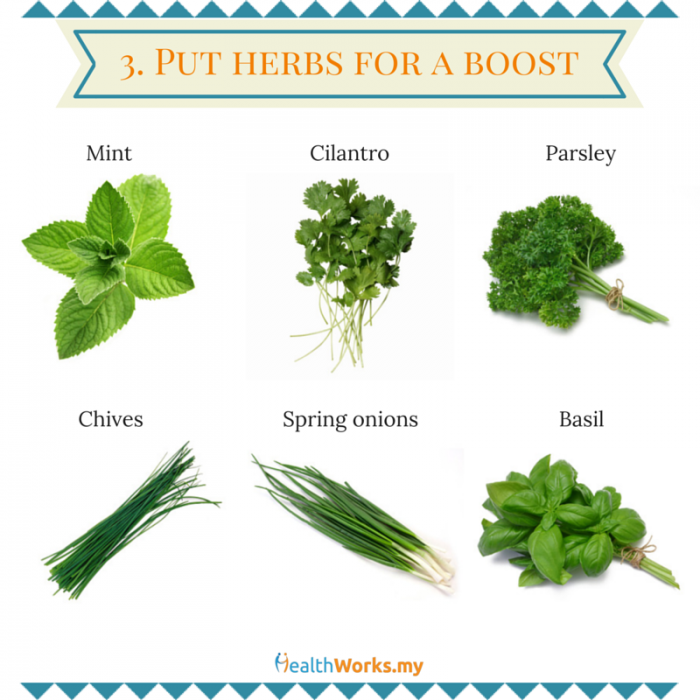 Herbs add a blast of flavour without piling on the calories, so why not make it one of the core ingredients? You don’t have to put much because each of these are packed with flavour even at a small amount. If you are battling with a blocked nose or flu, try adding some mint into your salad because mint can help to break down the phlegm and mucus . 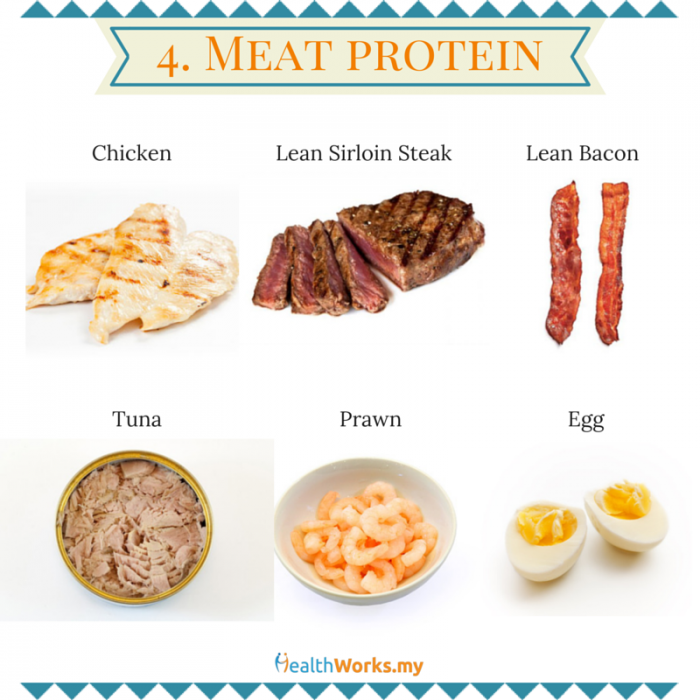 Depending on your preference, you can choose to add some meat protein to make you feel fuller longer. If you have leftover roast chicken, you can tear it into pieces and sprinkle it in your salad. Go for grilled, poached, clean baked method for the chicken, beef and seafood. As for the can of tuna, it is best to go for the ones that are packed in water instead of the mayo or oil versions because you will be adding your own salad dressing on top. Try to use less oil when you are frying or baking your bacon and get the leaner, less fat cuts of the meat (turkey or pork) so you can still get your bacon fix in a healthier way. 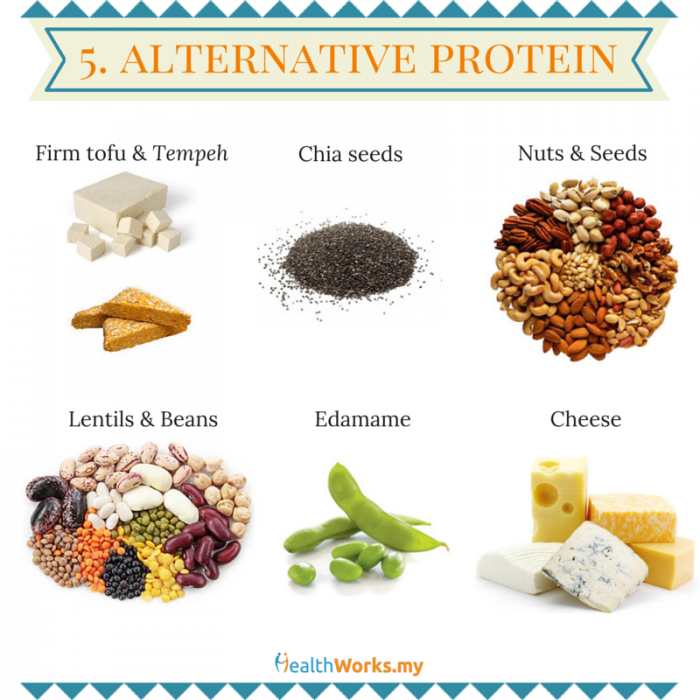 If you want to go for a plant-based and lower-calorie protein source, try chia seeds, tofu and many more. While nuts and edamame bring a nice crunch to your salad, don’t forget that they are still high in calories so about a small handful is just right for 1 portion. Beans and lentils provide a great amount of protein which can help to strengthen and repair our muscles . Blue cheese, goat’s cheese, and more will add a bit of creaminess to your salad while providing some calcium too! Pick blue cheese if you need help with your digestion because it it rich is probiotics to help those constipation problems . Adding cut fruits will make your salad more refreshing and balance the savoury flavour with a hint of sweetness. Lucky for you, we live in a tropical country with an abundance of juicy tropical fruits to choose from! 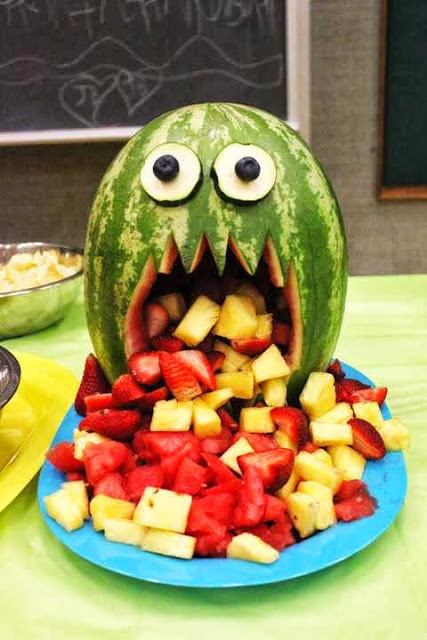 Just be careful of the portion because some fruits are high in sugar. 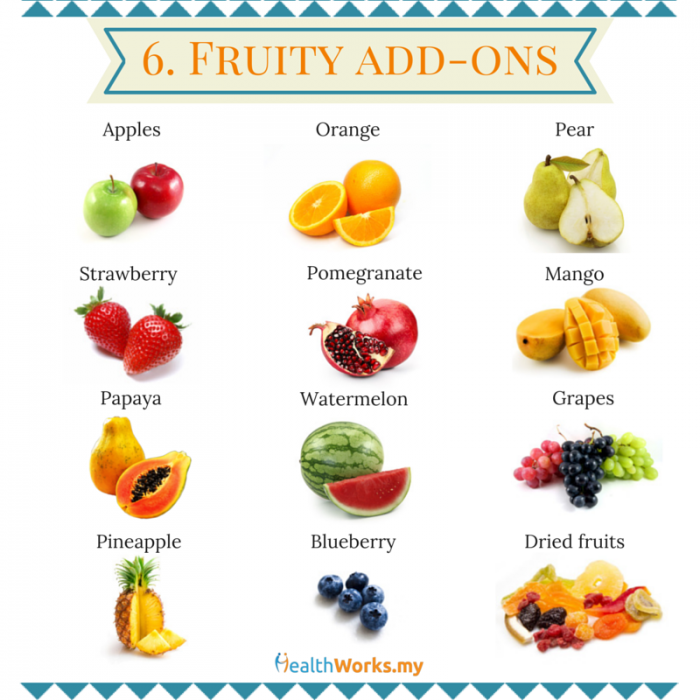 If you can’t get fresh fruits, dried fruits like raisins or cranberries are an option as well, but you have to watch out for the portion size as these are very high in sugar and calories. 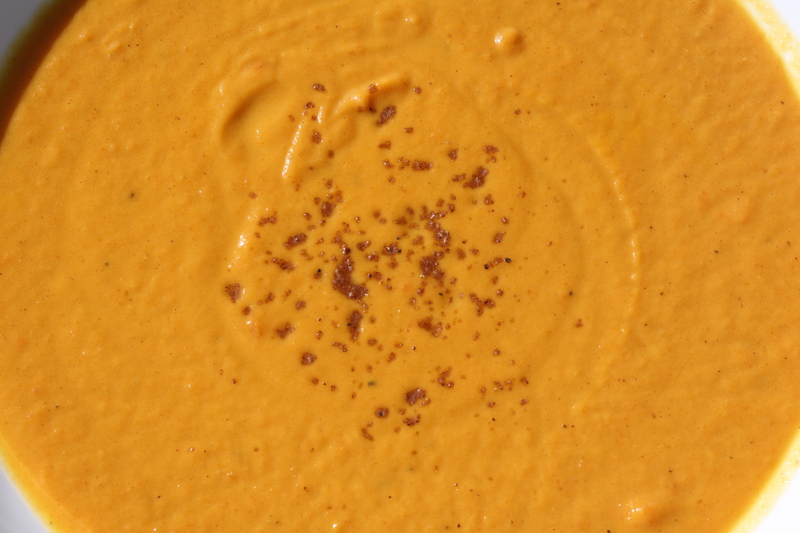 Here’s when you can play around a bit until you find your favourite kind of salad dressing. Do you like it sweet, sour, salty or a bit of everything? Usually you can play safe with just olive oil and balsamic vinegar but why not try adding some minced garlic into the mix? 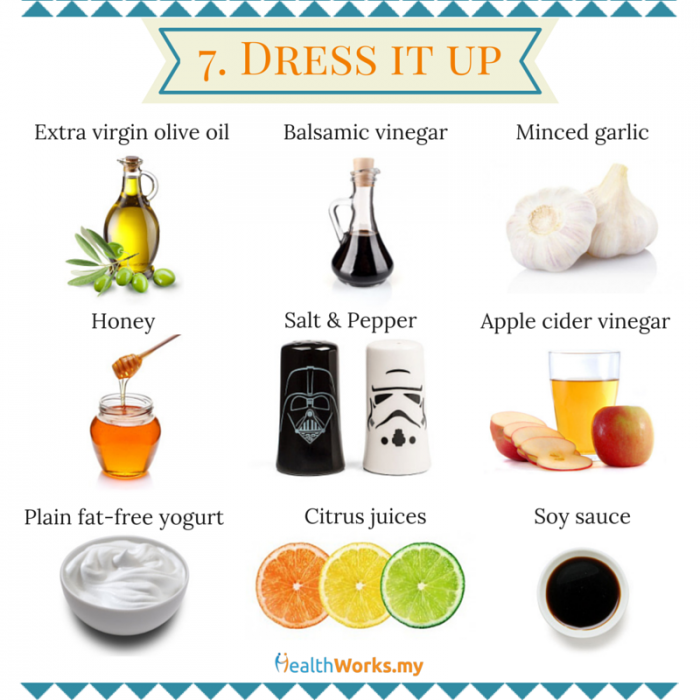 Garlic gives your dressing more flavour and it can help to detox your body too . Squeeze in some lime, lemon or orange juice to give the dressing more zing. Honey with soy sauce and minced garlic could make a nice Asian-inspired salad dressing. 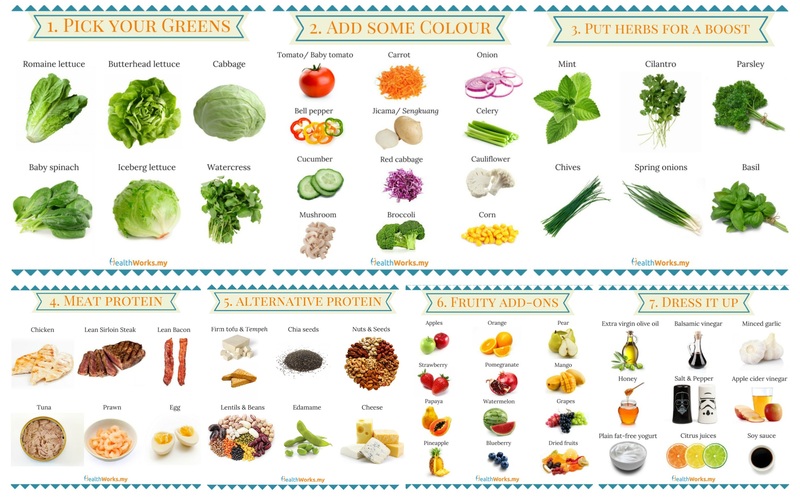 Quick tip: You can print this chart below so that the next time you are going grocery shopping so you can check off the ingredients that you need to prep some salads to take to work. If you plan to use a mason jar to pack your salad, check out our mason jar tips and recipes here. Remember to put wet ingredients first or pack the sauce separately in zip-lock bag so that your greens won’t get soggy. What is your favourite salad combination? 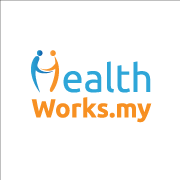 Feel free to share them here or on our Facebook page!